The sweet and crispy comfort treat turns 50 this year. McDonald’s apple pie has been on the chain's menu for 50 years, so it's pretty safe to say that it is a beloved dessert. Though it has undergone some changes over the years, a new tweak to the recipe announced earlier this month now has fans feeling sour about this classic treat. According to the chain, its new apple pie is made with fewer ingredients, consisting of mainly sugar, sliced instead of diced apples and an added touch of cinnamon. The recipe adjustment mimics other changes the chain has recently made in an effort to reduce its use of artificial additives. “We removed, for example, artificial preservatives from our Chicken McNuggets and switched to real butter in our breakfast sandwiches because those changes matter to our guests,” Tiffany Briggs, a McDonald's spokesperson, told TODAY Food. The new pie contains 240 calories per serving, 11 grams of fat, 36 grams of carbs and 16 grams of sugar. The older recipe actually had fewer grams of sugar with 13. The pies also sport a new lattice-style crust and are sprinkled with a sugar topping, instead of a brown sugar coating. The chain has always used a variety of apples in its filling (depending on the season) but now they're sticking to American-grown produce only, including Golden Delicious, Jonagold, Rome, Gala, Ida Red and Fuji. A culinary team created the latest pie recipe and taste tested the treat on both coasts before releasing the changes nationwide. Even still, after last week's rollout, the chain's biggest dessert fans were throwing a fit on social media. @McDonalds the apple pie crust was my treat with the brown sugar! Change it back! 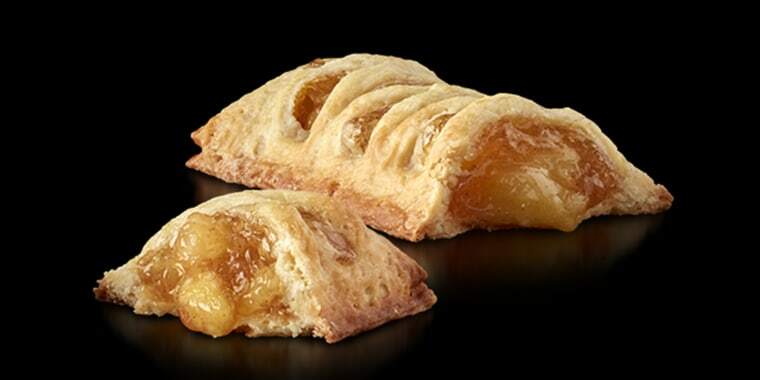 One thing is likely to remain the same, however: McDonald's will continue to offer some version of its apple pie. Over its half-century history, the dessert has actually had a few different makeovers. And apples aren't the only filling the chain has put into its pies. McDonald’s has filled pies with more than 40 different flavors over the course of 50 years, with options ranging from strawberry to pineapple and even s’mores. Overseas, the chain offers diverse varieties, too, including taro in China, sweet corn in Thailand and berries and currant in Britain. The recipe for McDonald’s original apple pie came from a Knoxville, Tennessee-based franchise owner, Litton Cochran, who opened that city’s first McDonald’s in 1960. The apple pie was actually the chain’s first dessert, contrary to what McFlurry lovers may think. But the presentation of the pie has always been a small, self-contained package. The original pie was served as it still is today, in a folded cardboard pocket, ideal for on-the-go eating.